Hi! My name is Danielle Jakel and I just adopted Chiclet (whose new name is Wesley) the Bichon yesterday. I thought I'd tell you about his first couple days with me. First of all, I just adore him! His temperment is just great. As soon as we got back to Newport Beach (his new home), I took him straight to Petco to spoil him with new supplies and toys and some time at their little doggy spa. 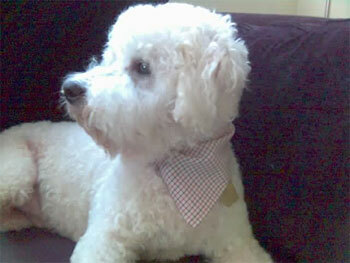 I attached a picture of him so you can see what he looked like after his grooming experience. Look how handsome! He LOVES to snuggle with me and always wants his little tummy tickled. He slept with me last night in my big comfy bed which he also loved. Overall, he did great and I'm SO happy I got him. Today we're off to Petsmart to get him a pet carrier so I can show him off to my family when I visit them in Illinois! Thank you guys SO much for rescueing this little boy. I'll make sure to keep you guys updated over time. Thanks again! !